Camille Pissarro was born on July 10, 1830 on the Caribbean island of St. Thomas. His father Abraham Gabriel Pissarro was of Jewish ancestry, and his mother Rachel Manzano-Pomié was of Spanish descent. At the age of 12 his parents sent him to a Parisian boarding school. The director of school noticed that he held an interest in art and urged him to take "advantage of his life in the tropics by drawing coconut trees." What better place than Paris could Pissarro pursue his career? After being in Paris for a few years, Pissarro had a chance encounter with Monet and Cézanne. Through this meeting he was introduced to all of Monet’s contemporaries, and he quickly joined their impressionist “group.” He soon realized that critics were too critical of this new movement so he joined forces with Monet and Degas to create the art exhibitions. Renoir, Sisley, Béliard, Guillaumin, Cézanne, and Berthe Morisot were among those whose works were offered and participated in the exhibitions. 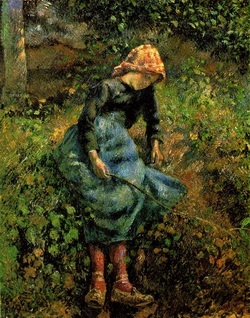 Pissarro was the only other impressionist painter who fought to make their movement known as Degas did. He was a heated debater, and he was very adamant in his artwork. It is no wonder that Pissarro kept in close correspondence with Degas for the rest of his life, and their relationship never faltered. They were both adamant to get their newfound movement exposed to the average population. Throughout his life and career, Pissarro painted mostly exotic landscapes as well as many different types of people. Riverscapes were one of his more prominent themes, but as he grew older his view slowly changed. 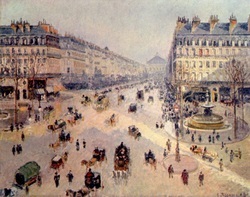 As came the modernization of Paris, Pissarro began painting more of the modern city, a departure from his normal medium. On November 13, 1903, Pissarro succumbed to blood poisoning. One of the most intriguing things about Pissarro is that he was not just a painter; he was also a political activist. He never let the two coincide though. His artwork never reflected his beliefs, but at the same he was adamant in his views. He was a strong character and did everything he could to make his artwork, as well as his movement, known to the rest of the world.